Today we visited Trinity College and the Book of Kells. Today we visited Trinity College and the Book of Kells. Trinity College is one of the most beautiful college campuses I've ever been to. The old architecture on many of the buildings was fascinating to see, and as I later found out, most of them are made from granite, which Ireland is known for. The architecture of Dublin is one of the highlights of the city, and the campus is a perfect example of this. I also now know about the number of people associated with the college who made significant scientific breakthroughs such as the steam turbine. The inside of the library was beautiful; it was the most impressive library I've ever seen. The number of historic texts still kept on those shelves is incredible, and it makes me wonder how much effort has been put into preserving the texts, especially the Book of Kells. 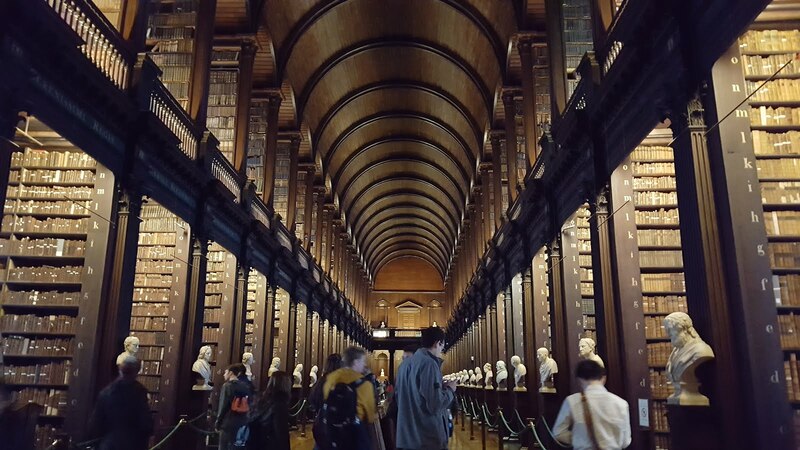 We walked through the museum and saw some ancient forms of writing, the way books were bound, and the types of inks used in the Book of Kells. There was also an exhibit that displayed eight images on just one page. It was really amazing how many icons were hidden away on the page, I didn’t even notice the all the little pictures on each page. Unfortunately, taking pictures of the Book of Kells was not allowed. After that we went to the long room of the library, which was really amazing. All the books, statues, and wood panels were cool.